Royal Casino blackjack tables feature a padded armrest, synthetic casino felts in full detail and color. A four deck dealer shoe with cut and dis card. Fully pleated skirts that cover the entire table front and back. ABS chip trays with 11.5 gram chips. 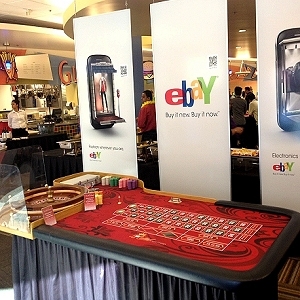 Display sign with chip denominations and table limits. 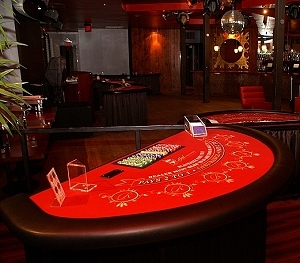 Royal Casino Roulette tables features synthetic casino felts in full detail and color. A single "0" and double "00" American Wheel. Fully pleated skirts that cover the entire table front and back. 13.5 gram chips. Display sign with chip denominations and table limits. 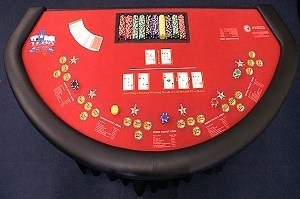 Royal Casino Craps tables features synthetic casino felts in full detail and color. Table capacity of 12 to 19 players at one time makes this game great for large guests counts. Fully pleated skirts that cover the entire table front and back. 13.5 gram chips. Display sign with chip denominations and table limits. We now offer Craps Bonus! 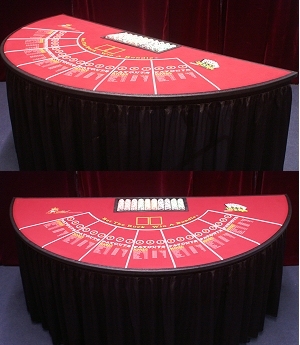 We are the only Casino Company with this custom felt that is now played in Vegas Casinos. 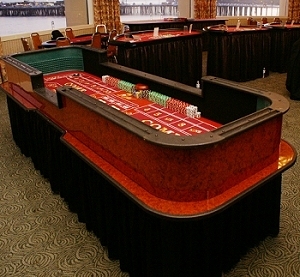 Royal Casino Poker tables feature a padded armrest, synthetic casino felts in full detail and color. Poker tables seat 9 players comfortably. 11.5 gram chips, Dealer Button, and Copag Playing Cards. 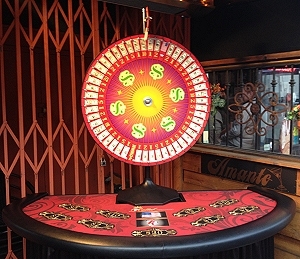 Royal Casino Money Wheel and table feature synthetic casino felts in full detail and color. A simple game as your guests place bets on the winning dollar amount! spin the wheel and win BIG!. 11.5 gram chips. Fully pleated skirts that cover the entire table front and back. 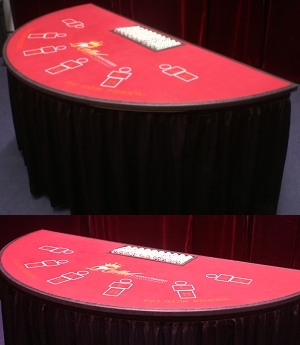 Royal Casino Hold'em Bonus tables feature synthetic casino felts in full detail and color with padded armrests. Poker fans will enjoy this game without having a full table. Play against the dealer and the house will pay out BIG!. This game is played same way as Texas Hold'em but without having more than 1 player as you play against the dealer. 11.5 gram chips, Copag Cards, Dealer Button. 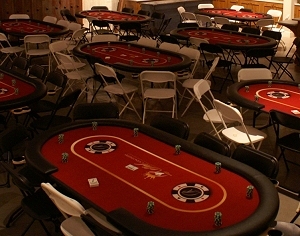 Casino War Tables feature synthetic casino felts in full detail and color. One card each is dealt to a dealer and to a player. If the player's card is higher, he or she wins back two times his or her own wager, plus the raise amount.  However, if the dealer's card is higher, the player loses their bet. Tables come with fully pleated skirts that cover the entire table front and back. 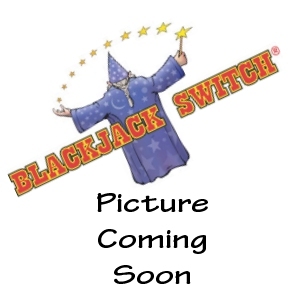 Royal Casino Blackjack Switch table feature synthetic casino felts in full detail and color.Blackjack Switch is a casino gambling game and patented in 2009. It is based on blackjack, but differs in that two hands, rather than one, are dealt to each playing position, and the player is initially allowed to exchange ("switch") the top two cards between hands. Natural blackjacks are paid 1:1 instead of the standard 3:2, and a dealer hard 22 pushes all player hands except a natural. Table comes with fully pleated skirts that cover the entire table front and back. 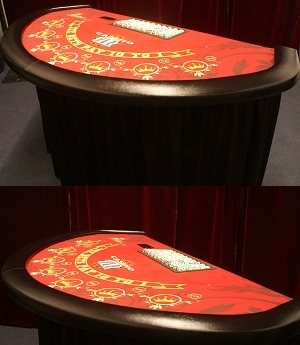 Royal Casino Pai Gow Poker table feature synthetic casino felts in full detail and color. The object of Pai Gow poker is for a player to create two poker hands out of the seven-card hand he/she is dealt by the dealer: a five-card hand, and a two-card poker hand. According to the rules, the five-card hand's value must exceed the two-card hand's, and that is why the two-card hand is often called the hand "in front" or "on top" or "hair", or the "small" or "minor" or "low" hand. The five-card hand is called the hand "behind", or the "bottom" or "high" or "big" (as they are placed that way in front of the player, when the player is done setting them). Tables come with fully pleated skirts that cover the entire table front and back. 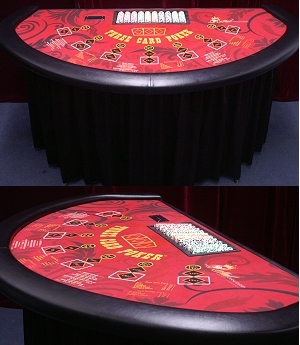 Royal Casino Let It Ride table feature synthetic casino felts in full detail and color. The Let It Ride game is a variation of five-card stud, based on three player cards and two community cards. The two community cards are initially dealt face down. The most distinguishing feature of Let It Ride is that the player is given two opportunities to withdraw exactly one-third of their initial wager. One chance occurs after the player looks at their hand but before the first community card is revealed, and the second occurs after the first community card is revealed, but before the second is revealed. The player may reduce their wager on either of these occasions, or on both, or neither. If the player decides not to withdraw part of their wager, they are said to "let it ride". Tables come with fully pleated skirts that cover the entire table front and back. Royal Casino Three Card Poker table feature synthetic casino felts in full detail and color.Three Card Poker incorporates two modes of play. The Ante and Play wagers play in competition on the player hand against the dealer hand. The Pair Plus wager is paid on a pay scale basis that the player hand will be a pair or better. In most casinos both the Ante and the Pair Plus are optional, but there are some casinos in which the Ante is mandatory. After all Ante and Pair Plus wagers are placed, three cards are dealt to each player and the dealer. Players that have placed the Ante wager have a choice to either fold or continue in the game by placing a Play wager equal to the Ante. Hands are then exposed and wagers resolved. The dealer hand must be Queen high or better for the dealer hand to play. Table come with fully pleated skirts that cover the entire table front and back. Royal Casino BINGO table feature synthetic casino felts in full detail and color. 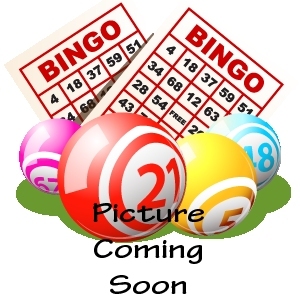 A typical Bingo game utilizes the numbers 1 through 75. The five columns of the card are labeled 'B', 'I', 'N', 'G', and 'O' from left to right. The center space is usually marked "Free" or "Free Space", and is considered automatically filled. The range of printed numbers that can appear on the card is normally restricted by column, with the 'B' column only containing numbers between 1 and 15 inclusive, the 'I' column containing only 16 through 30, 'N' containing 31 through 45, 'G' containing 46 through 60, and 'O' containing 61 through 75. Table comes with fully pleated skirts that cover the entire table front and back.